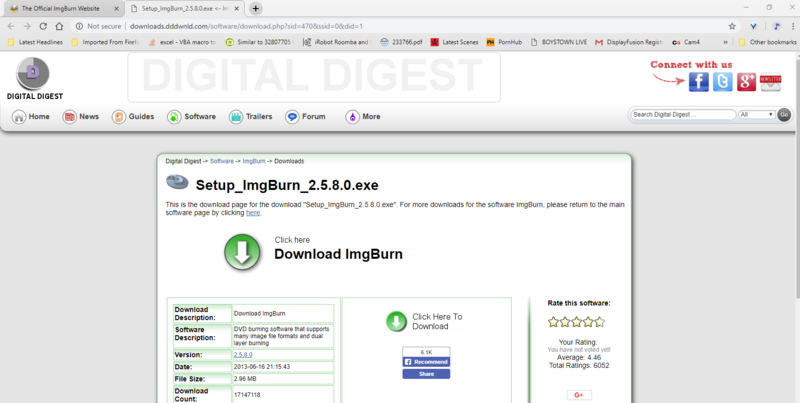 I should have known when I had to decline the installation of optional software, but I picked up several viruses (110 files quarrantined) after trying to install ImgBurn from the first mirror in my list -- Digital Digest. You really need to blow this mirror away. Can you take an image of the download page as you see it please? These things are region specific, so it doesn't work if I look. I spoke to the admin of the site a few weeks ago and he assured me the actual download is now exactly what I gave him - 100% clean. Maybe you clicked on an advert? You really need to blow away this mirror. It was the first option in my list when I went to download your software. It's full of viruses and I couldn't stop them once they started. Had to quarrantine 125 files. Here you go. The first is a screen shot of the mirror list. And the second is what you get when you choose Digital Digest. and did you click on the big (advert) 'Click Here Download ImgBurn' one or the (correct) 'Click Here To Download' (just above the facebook stuff) button? And you don't need to create multiple topics for the same issue.